Most of us spend lots of time shopping around for the best deal on the things we buy while spending more money on taxes than anything else. Why not “shop around” to save money on life’s single largest expense? Join Jason as he talks with famed CPA, Diane Kennedy, about the tax strategies of wealthy real estate investors and business people. Diane Kennedy, a preeminent tax strategist, is the founder of USTaxAid Services, a leading tax firm that works with clients throughout the U.S. and founder of TaxLoopholes, an award-winning online tax education site. 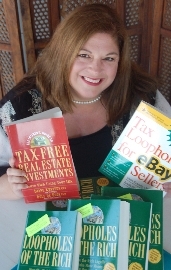 Diane is the author of The Wall Street Journal and Business Week bestsellers, Loopholes of the Rich and Real Estate Loopholes, and co-author of The Insider’s Guide To Real Estate Investing Loopholes, The Insider’s Guide to Making Money in Real Estate, The Insider’s Guide to Tax Free Real Estate Investing and Tax Loopholes for eBay® Sellers.